Remember those lemons I got a couple of weeks ago? Well they only last outside of the fridge for so long, so I needed to use them up. One night I decided to whip together some lemon spice rice. Wow - utter disaster. The aftertaste was terrible and our tongues burned as a result of too many spices and too much parmesan cheese. Sadly, our chicken breasts that night were kind of grizzly and fatty and nasty (definitely not my fault, definitely the chicken's fault), so our entire dinner was a flop. About 20 minutes after we finished eating, we were both hungry. Thankfully I had some Pillsbury giant cinnamon rolls in the fridge. I popped those suckers in the oven and we had breakfast for dinner #2. My first idea for lemons was a bust, but my second definitely wasn't. These muffins are moist and have just the right amount of lemon flavor. Preheat oven to 400 degrees. Place paper muffin liners in a muffin tin. Place the muffin tin on a baking sheet and set aside. In a large bowl, rub the sugar with the lemon zest until the sugar is a light yellow and it smells deliciously like lemon. Whisk in the flour, baking powder, baking soda and salt. In a medium sized bowl, whisk together the eggs, sour cream, vanilla, melted butter, and lemon juice. Add the wet ingredients to the dry ingredients and fold together. When almost thoroughly mixed, add the poppy seeds. Do not overmix. Divide batter between muffin cups. Sprinkle the granulated sugar over the soon-to-be muffins. Bake for 15-18 minutes or until tops are golden and a toothpick inserted into the center of a muffin comes out clean. Let cool in pan for five minutes, then transfer to wire rack to cool completely before glazing. Add just enough lemon juice to the powdered sugar to make a glazey consistency. 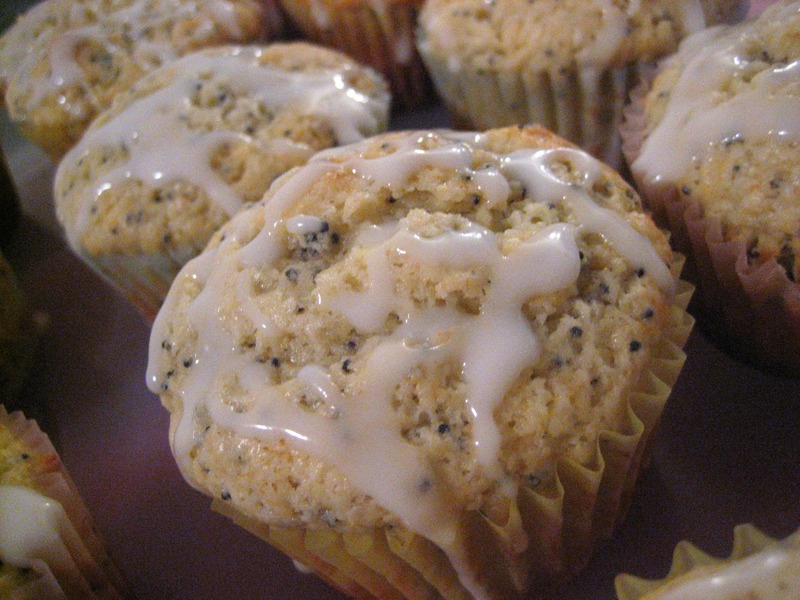 Drizzle on each of the muffins. Store in an airtight container. Makes 12-15 muffins.